Zen APUs are coming in Febuary which feature the Global Foundries 14nm process found in the current generation Ryzen CPUs. 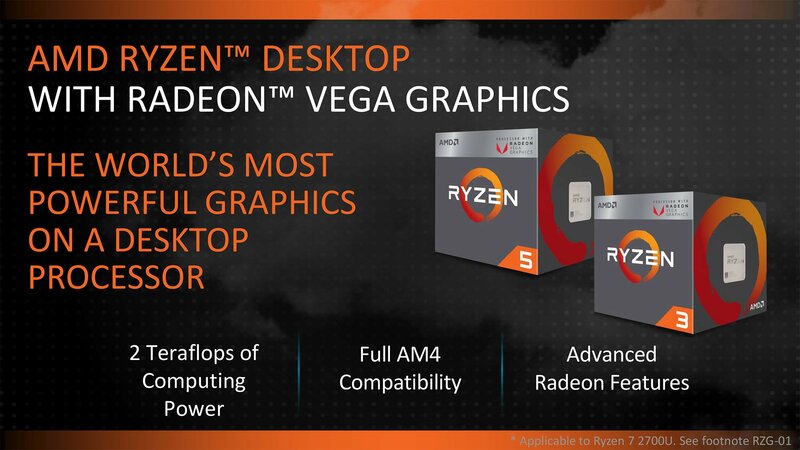 Both models will feature quad cores, but the Ryzen 5 2400G features SMT, a base clock of 3.6GHz/boost clock of 3.9GHz and 11 Vega CUs for $169. The Ryzen 3 2200G will lack SMT, be clocked at 3.5GHz/ boosts up to 3.7GHz, it will sport 8 Vega CUs and is priced at a very low $99. AMD says it should compete well with a GTX 1030 and by our estimations should be good enough for entry level 1080P Gaming. Ryzen 2, (which is Zen+) will have a staggered release with Ryzen 7 coming in April, and the other models coming at a later date in Q2. This features Global Foundries 12nm process, which should offer 10%+ better performance per watt over the last generation Ryzen CPUs. It was also noted that the new 12nm process focuses on features to optimize performance per watt. We are told to expect higher clock speeds, which we’ve speculated for a while and we are happy that AMD has confirmed. One of the biggest problems for first generation Ryzen CPUs was the CPUs being limited to 4GHz while Intel’s 7th and 8th Generation was able to hit 5GHz. We are also told we will see Threadripper 2 coming sometime in 2nd half of this year. Aside from that details seem to be scant. 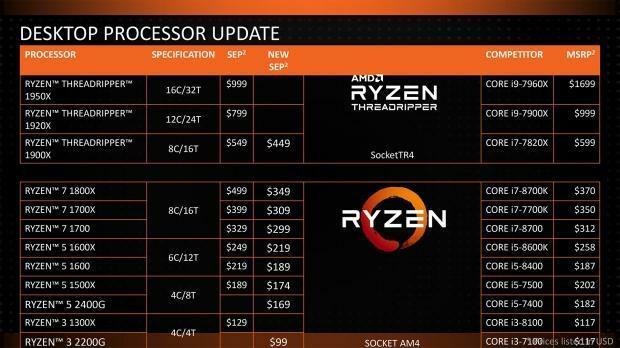 AMD has also cut the prices on the current Ryzen lineup. Prices seem to match the Black Friday and Cyber Monday sales of last year. Much to the benefit of users these lowered prices are now available at Amazon.